Batch Templates allow you to specify which fields to include, and set presets within the Gift Batch Interface. 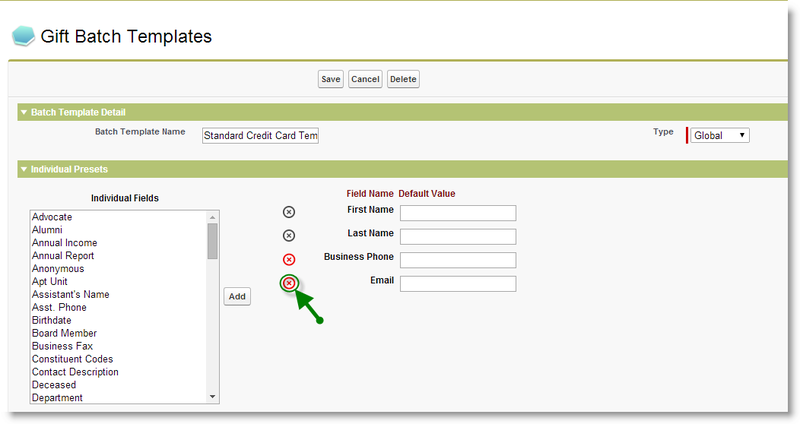 You can include fields from an Individual, Organization, Transaction, Recurring Gift, Payment and Allocation record. The ability to set presets means that you can set a default value within a field. For example, if you are entering a large volume of gifts received at an event, you may want to set the same allocation information and transaction date for all of them. By presetting the allocation information and transaction date, it makes it easier to enter gifts within the Gift Batch since this information is already populated within the interface. Setting a field to "read-only"
Setting a field to be "hidden"
The Batch Templates tab allows you to view and create Batch Templates. Click on Batch Templates from the tab ribbon. If the Batch Templates Tab is not visible in the tab ribbon, click on the + sign at the end to access all tabs. You will find Batch Templates as an option in the list of all tabs. Personal batch Templates are templates that are visible only to the user who created them. To view all your personal Batch templates, select Personal as the Template Type and click on "Go". Then click on the Template name to view the template. Global Batch Templates are templates that are visible to all users regardless of who created them. To view global Batch templates, select Global as the Template Type and click on "Go". Before creating a new batch template, it is always best practice to check if the template you are about to create already exists within the application. Enter a Batch Template Name. To set the Batch Template to Personal, select the type as “Personal”. To set the Batch Template to Global, select the type as “Global”. The Batch Template allows you to specify which fields to include in the Gift Batch Interface. Fields that are required by Causeview to create the transaction, payment and allocation records are part of the template, by default, and cannot be removed (i.e. First Name, Last Name, Organization Name, Payment Date, Amount, Appeal, and Fund). To add a field to the Gift Batch Interface, select the field from the list of available fields and click on the “Add” button. You may hold down your CTRL or SHIFT keys to select multiple fields and add them all at once. To remove a field, click on the Delete Icon (red “X” that appears beside the field). A gray delete icon signifies that the field cannot be removed from the template. The Batch Template allows you to re-order fields according to how you would like them displayed on the Gift Batch Interface. To re-order fields, place your cursor on top of the field you would like to move and then drag and drop it to where you would like it to appear. Setting presets means that you can set a default value within a field. For example, if you are entering a large volume of gifts received at an event, you may want to set the same allocation information and transaction date for all of them. By presetting the allocation information and transaction date, it makes it easier to enter gifts within the Gift Batch since this information is already populated within the interface. To preset a value in a text field, simply enter the value. You can also preset values in a picklist. And preset values for Look-up fields. To remove a preset, simply remove the value within a text field, a picklist or a look-up field. A field may be set to “read-only” if you would like to restrict modifying capabilities. For example, perhaps you have set a preset for allocation and would like to prevent others from modifying the preset value. To make a field “read-only”, select the checkbox beside the field, under the “Read-Only” column. A field may be hidden from the Gift Batch interface if you do not wish for it to display during gift entry. For example, perhaps you’ve set a preset to automatically email receipts but you do not necessarily wish to have this field displayed in your Gift Batch interface. To hide a field from the gift batch interface, select the checkbox beside the field, under the column “Hide”. The Gift Batch Interface mimics Excel where you can tab from field to field as you enter gift information. To facilitate rapid data entry, you can specify fields in the template to be displayed as columns in the gift batch interface. Fields that are not displayed as columns in the gift batch interface are still available in the expanded view. To display a field as a column in the Gift Batch interface, select the checkbox beside the field, under the column “Show in Summary”. Batch Templates allow you to specify which payment types are available in the Gift Batch Interface. If you select a single payment type, the fields related to the payment type can be added as columns in the gift batch interface. 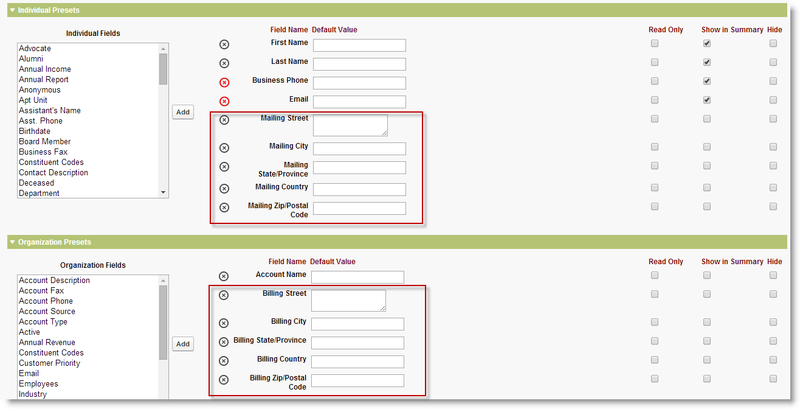 However, if multiple payment types are selected, you would have to populate payment information in the expanded view. To specify payment types to be included, select the payment type from the list of available payment types and use the directional arrows to include your selection. When a payment type is selected, the associated payment fields are automatically added to the Batch Template. For example, if you select Check, the Check Number, Check Date, and Date Deposited fields are automatically added. 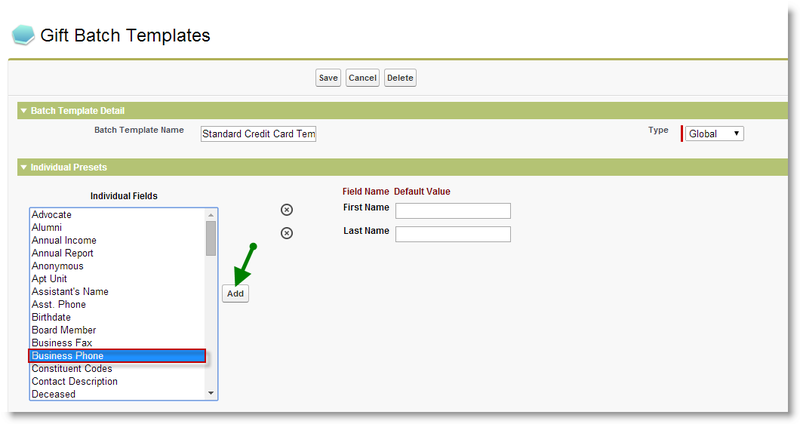 When Credit Card or ACH/PAD is selected, the associated payment fields are automatically added to the Batch Template. It will also automatically add the Mailing Street, Mailing City, Mailing Province/State, Mailing Country and Mailing Zip/Postal Code fields for the Individual and the Billing Street, Billing City, Billing Province/State, Billing Country and Billing Zip/Postal Code for the Organization. These fields are automatically added and cannot be removed from the template since the Payment Gateway requires these fields to be populated in order to process the payment. You can also automatically email receipts to donors within the Gift Batch Interface but the “Auto Email Receipt” field needs to be included in the Batch Template. To do so, navigate to the “Receipt Presets” section of the Batch Template and add the “Auto Email Receipt” field in your Batch Template. Then as you enter gifts within your Gift Batch, you can specify whether you would like to automatically email the receipt to the donor. You may also preset the Auto Email Receipt preference to enabled so that it is automatically selected for all gifts you enter in the Gift Batch. It is important that you save your Batch Template before navigating away from the page. You should also remember to save any changes that have been made to an existing template. To save your Batch Template, click on the “Save” button located at the top or at the bottom of the template. Cloning an existing Batch Template allows you to copy an existing template. This is particularly useful when you want to make minor changes to an existing template and save as new. To clone an existing template, click on the “Clone” button located on top of the template. When you clone a template, it copies all the fields you have already included in the original template as well as your presets. You can then edit the cloned template according to what you need. To save, enter a Batch Template Name and click on “Save”. New Gift Batch Records can be created from the Batch Template. To do so, click on the “New Batch” button located at the top or at the bottom of the template.